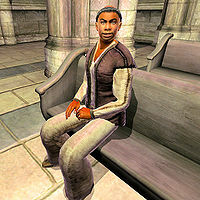 Cirroc, a Redguard, is a Layman of the Nine Divines and the resident healer at the Great Chapel of Talos in Bruma. He offers basic training in Restoration, and is involved in a quest for the Fighters Guild. He knows the standard Leveled Healer spells as well as one extra major Restoration spell. In agreement with the other two inhabitants of the Chapel, Priestess Isa Raman and Primate Arentus Falvius, Cirroc struggles hard to get the superstitious Nords in Bruma to forget their beliefs in Ysmir and turn to the Nine. He wakes up in the Chapel Hall every morning at 6am and spends the first two hours of the day dividing his time between the Hall and the main part of the Chapel. At 8am he receives a single blessing from the Altar of Mara and then spends four hours on a pew in silent prayer, only interrupted by another blessing from Zenithar at 10am. At noon he returns to strolling back and forth between the Chapel Hall and the Chapel until it is time for yet another blessing at 4pm, this time from Stendarr, followed by two additional hours of praying on the pew. At 6pm he heads downstairs and eats a two-hour dinner with the Priestess and Primate and spends the rest of the evening strolling back and forth between the Hall and Chapel once again. At midnight he finds an available bed and goes to sleep. There are a few exceptions to this routine; when Martin leads the allied Army out to the Defense of Bruma, Cirroc is one of the citizens who cheers as he leaves. Once the related quest is initiated, Cirroc will cancel all his daily appointments, including his sleep, and await your arrival to the Chapel. He will offer training when he is not eating, sleeping or praying. He wears a brown shirt, light brown linens and a pair of pigskin shoes. He carries the Bruma chapel key along with a modest amount of gold. After the quest, he will also carry the Stone of St. Alessia. When you meet him for the first time, he will politely introduce himself: "I'm Cirroc, Bruma's Chapel Healer." When asked about Bruma he will tell you about the many challenges the Chapel faces in Bruma: "The Chapel has made enemies here in the past. The Nords prefer their dragon Ysmir to our Father Akatosh." When you are assigned by the Fighters Guild to help Cirroc reclaim the Stone of St. Alessia, he will greet you differently: "Greetings, my friend. You must be from the Fighters Guild. We appreciate your help." When asked about the stone, Cirroc will tell the tale: "It's said the Stone was blessed by Alessia herself, and while it remains in our possession, no harm may come to our church. The relic was stolen from us not long ago. A group of men was seen leaving the Chapel the night the stone was stolen. We believe they were bandits. From all accounts, there were four or five of them, and they've been seen heading east on the road. Please, find the Stone of St. Alessia." He will send you on your way with a plea: "Find the Stone, please!" When you return from Sedor he will ask for news: "Have you found it? Have you brought back the Stone of St. Alessia?" When you hand him the Stone, a relieved Cirroc will give you a small reward and say: "Ahh... you've found it! I can't thank you enough. Your work is greatly appreciated. Here, take these. I wish I could give you more." If you listen to the citizens of Bruma, they will talk about Cirroc, saying "Cirroc is a good healer. He's a Redguard, but you'd think he was a Nord, the way he acts. ", "Good that we have a healer in town. Cirroc can fix most anything that ails you. After all these years, he almost seems like a Nord himself. ", "He's certainly become more like a Nord over the years. Quite a competent healer, too. ", "It's almost as if he grew up in Skyrim. I don't think the church likes it, but his healing skills are invaluable." and "A good healer makes for a happy town. And Cirroc almost seems like another Nord to me!" Others may simply comment: "Isn't Cirroc an excellent healer?" and "Aren't we lucky to have a skilled healer in town?"